On Jan 12, 2013, the "Marcos Dias" left the anchorage of Santos bound for Rio de Janeiro, Ilha da Conceicao, where it docked on Jan 13 at 11.30 a.m. 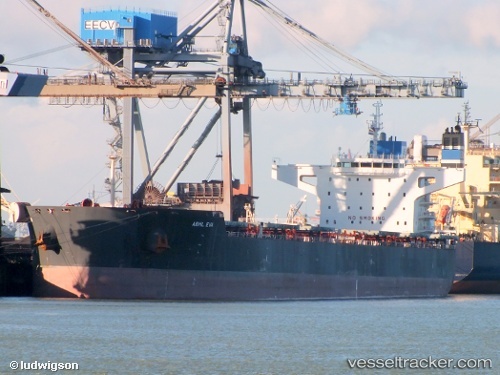 The ship had been in collision with the Turkish cargo m/v "ABML Eva" (IMO: 9070565), on Dec 31, 2012 at 6.30 p.m. after a loss of its propulsion system. The "Marcos Dias" had been coming from the cradle terminal 5 in Usiminas to unload 40,000 tons of iron ore, coming from Rio de Janeiro. The vessel dropped two anchors, but drifted into the "ABML Eva", thereby suffering damage to the port side foreship. Also the P4 Portainer at the warehouse 37 of Libra Terminals was pushed off the rails, and the quay fendering was damaged. Pending the Investigation, the release of the "Marcos Dias" was delayed. Also the "ABML Eva" left Santos only on Jan 13.